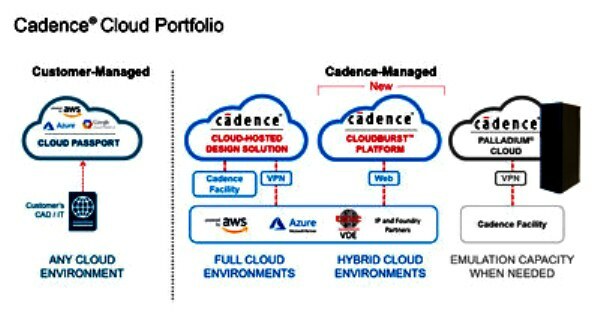 Cadence Design Systems, Inc. (NASDAQ: CDNS) today announced the availability of the new Cadence® CloudBurst™ Platform for hybrid cloud environments, providing customers with fast and easy access to pre-installed Cadence design tools in a ready-to-use cloud environment built on either Amazon Web Services (AWS) or Microsoft Azure. The new platform is the latest addition to the Cadence Cloud portfolio, and this continued innovation further advances Cadence's leadership position in cloud-based offerings for semiconductor and electronic system design. The Cadence CloudBurst platform enables companies of all sizes to build upon the standard benefits of the broader Cadence Cloud portfolio - improved productivity, scalability, security and flexibility - with a deployment option that delivers a hybrid cloud environment in just a day or two after initial purchase versus the typical timeframes for internally provided cloud solutions that can take weeks to deploy. It offers customers a production-proven, Cadence-managed environment for compute-intensive EDA workloads with no tool installation or cloud set-up required so that engineers can stay focused on completing critical, revenue-generating design projects. · Ability to address today's design challenges: The platform provides convenient and secure browser-based access to the scale of cloud computing options and includes unique file-transfer technology that significantly accelerates the transfer speed of the massive files created by today's complex system-on-chip (SoC) designs. · Ease of deployment: The platform complements existing on-premises datacenter investments and enables CAD and IT teams to easily address peak needs by providing a hybrid environment without requiring prior cloud expertise. · Access to a broad set of Cadence tools: The platform supports a range of cloud-ready tools including functional verification, circuit simulation, library characterization and signoff tools, which benefit from cloud-scale compute resources. · Streamlined ordering process: Customers can utilize existing ordering and licensing systems, eliminating sometimes lengthy legal and administrative hassles so customers can begin using the cloud for design projects quickly. The broader Cadence Cloud portfolio consists of the new CloudBurst platform as well as the customer-managed Cloud Passport model and the Cadence-managed Cloud-Hosted Design Solution and Palladium® Cloud solutions. The Cadence-managed offerings provide customers with solutions that fully support TSMC's Open Innovation Platform® Virtual Design Environment (OIP VDE), an innovative service that provides a complete SoC design environment for customers to design securely in the cloud and enhance their productivity. The portfolio offerings support the broader Cadence System Design Enablement strategy, which enables systems and semiconductor companies to create complete, differentiated end products more efficiently.